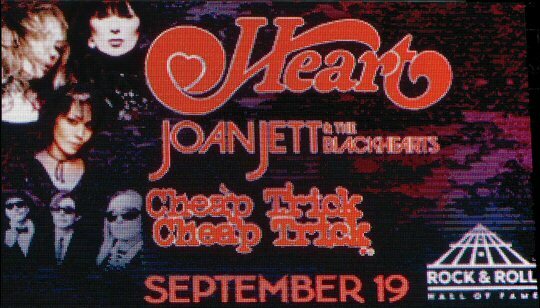 The Rock Hall Three For All Tour featuring Heart, Joan Jett & The Blackhearts and Cheap Trick rolled into town on Tuesday, September 20, 2016 and played to an enthusiastic sold-out crowd at the Ascend Amphitheater in Nashville, Tennessee. All three acts are enshrined in Cleveland and they proudly displayed in Music City why those accolades are so duly deserved. 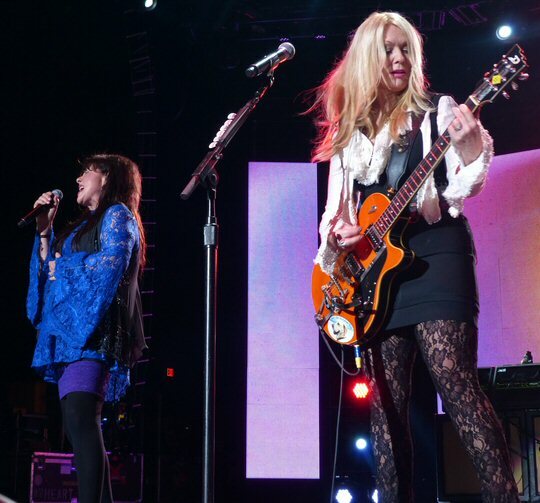 Nancy and Ann Wilson on stage at the Ascend Amphitheater. The trio of rock royalty were winding down their two-month summer trek when the buses pulled in off of First Avenue to park by the Cumberland River. The artists could see the light at the end of the tunnel but there was still an evening's worth of work to do for the fervent fans who still surrender to their love of rock 'n' roll. Heart first showed the world that women can rock when their hits like "Crazy on You", "Barracuda", "Straight On" and many more stormed the charts in the seventies. Not only did the Wilson sisters lead the band, they wrote the songs and played the instruments too, making them the first women in rock to do so. Heart continued topping the Billboard back pages through the '80's and '90's with huge songs like "These Dreams", "Alone", "What About Love", "If Looks Could Kill" and "Never" that showcased the sisters' enormous talents as musicians, singers and songwriters. Along the way, music by Ann and Nancy Wilson and their band Heart sold more than 35 million albums, sold out arenas worldwide, and found their way into the soundtrack of American life through radio, motion pictures, television, and associations with branded sponsors. Powerful and exciting on stage, Heart continues to perform their amazing show to many hundreds of thousands of fans annually as in Nashville and around the world. Ann and Nancy Wilson were the headliners at the Ascend. Both hard-rocking women are now in their sixties and they are still required to deliver their potent and challenging catalogue of classics night after night. Something that was once seemingly effortless for the pair no longer comes easy - the sisters were working and concentrating on getting the Heart attack just right for the knowledgeable audience in the amphitheater. 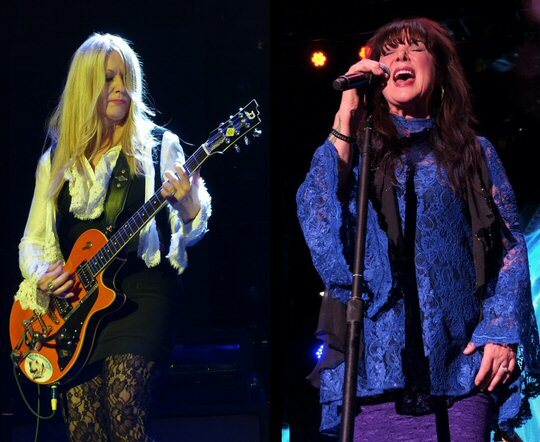 Heart headlined the Rock Hall Three For All Tour in Nashville. After the raucous opener "Wild Child" Heart went straight into "Magic Man" that potently displayed Ann's sturdy and dramatic chops but you could tell she was relieved to have completed it for a successful one-two punch to start the show. Speaking of that, "Two" was a Ne-Yo cover and a surprising highlight of the night. The band then presented the title track from their newest Beautiful Broken that proved the pair are still producing beautiful music to this day. On this night Ann Wilson's scorching soprano was mostly still fully in tact. Still, at times there was a slight hint of struggle and fatigue that could be born out of a solid summer's worth of being out on the road. As the years progress you have to wonder how much longer they'll be able to pull off these scorching and demanding presentations in a live setting. Case in point - the ladies have long been called America's female Led Zeppelin and Heart finished their showcase with laudable takes on "Immigrant Song" and "Stairway to Heaven". Their version of the latter brought singer Robert Plant to tears a few years back and you got to remember that even that gyrating rock god bowed out when he thought he could no longer do the material justice. It's not unprecedented. Still, we hope the Heart keeps beating for a long time to come. Joan Jett is an originator, an innovator, and a visionary. As the leader of the hard-rocking Blackhearts, with whom she has become a Rock & Roll Hall of Fame inductee, she's had eight platinum and gold albums and nine Top 40 singles, including the classics "Bad Reputation," "I Love Rock 'N' Roll," "I Hate Myself For Loving You," and "Crimson and Clover." She sits at the head of her own independent label, Blackheart Records. Jett has acted in movies and television, including 1987's "Light Of Day," and in a Tony-nominated Broadway musical, "The Rocky Horror Show." She has appeared on such acclaimed television shows as "Oprah" (the last season) and 'Law and Order." Jett and the Blackhearts released their latest record, "Unvarnished," last year and continue touring the globe to throngs of adoring fans. Joan Jett's enshrining in Ohio has helped her cement a long overdue comeback in recent years and that's why we found it curious that she limited photo access for the media in the industry hotbed of Nashville. Still, we guess she was content with letting the music do the talking and you forget how many hits she had until you see them all proficiently played in one place as they were on this evening. Jett's punk rock inspired presentation looked a little easier on the vocal chords as she presented them with the rebellious New York City attitude that put her on the map in the first place. "Cherry Bomb" was an explosive opener as The Runaways top song chugged along to a great reception. "Do You Wanna Touch Me (Oh Yeah)" remained slightly risqu� this far down the line in a Southern setting. "TMI" was a notable new one while "Everyday People" was a sly and slightly ambitious cover to cap off the evening's second act. 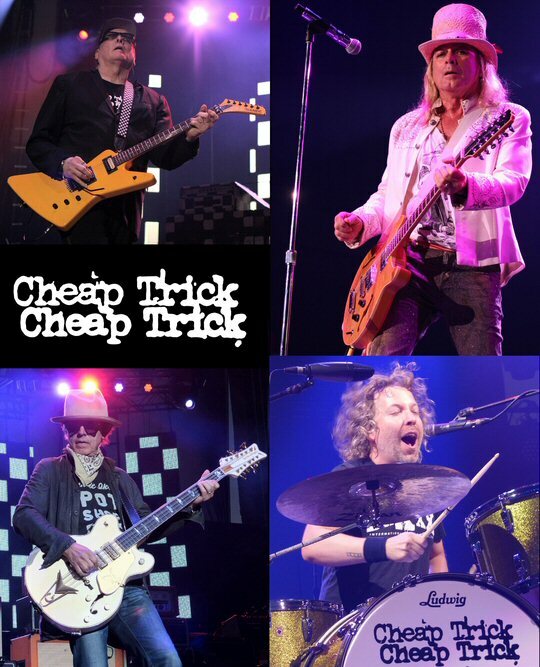 With over 5,000 performances spanning four decades and 20 million records sold worldwide, Cheap Trick is undoubtedly one of the most influential classic rock groups of the past 50 years. The band was formed in 1974 and while it has evolved throughout the years, Cheap Trick has continued to reach mainstream and critical success. Hits such as "I Want You To Want Me," "Dream Police," and "Surrender" have cemented the group as one of America's top rock 'n' roll bands of all time. Cheap Trick once again lit the flame in Music City. The recent Rock Hall inductees Cheap Trick got the activity at the Ascend off and running with the hell-raising "Hello There". Their opening slot included takes on classics by the Beatles and The Velvet Underground ("Day Tripper" and "I'm Waiting for the Man") in addition to a new track and many old favorites. Cheap Trick kept "The Flame" burning brightly near Broadway as they shuffled to and fro on stage during their frenetic and energetic set. Robin Zander is a renowned singer and frontman who himself is also an aging rocker tasked with performing material he made as a much younger man and he was up to it. Of course, the quartet now has an infusion of energy from goofy but great guitarist Rick Nielsen's son Daxx on drums. The Rock Hall Three For All Tour as presented in Nashville was a triumphant success by a powerful triumvirate of regaled recording artists. Together, the acclaimed acts presented over three hours of entertainment including some of classic rock radio's biggest hits proving that the heart of rock 'n' roll was still beating proudly and loudly as a long hot summer in Music City neared its end. 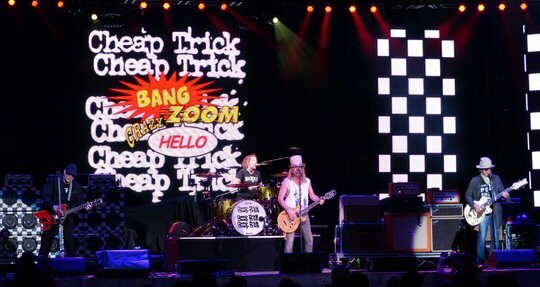 Cheap Trick still has that dreamy and arresting power pop prowess.